Berkeley, Calif. • Utah ordinarily is a decent defensive team in first halves, when the opponent is shooting at the basket closest to the Utes’ bench and Utah’s coaches can more readily instruct their players. With less supervision at the far end of the court, the Utes tend to have major lapses in second halves. That trend changed Saturday night, and radically so. The Utes held California to six points in the last seven minutes of an 82-64 victory at Haas Pavilion, completing the program’s first road sweep of the Bay Area schools and moving into a tie for second place in the Pac-12. Cal scored only 22 points in the second half, when the Utes slowed down the game, established their defense and stopped letting the Bears launch 3-pointers. “I’ve said it a lot: I’m just really confident in the guys we have, especially when we’re playing assertive and aggressive and we’re defending,” said senior guard Sedrick Barefield, who led the Utes with 21 points.Freshman guard Both Gach added 18 points in his biggest offensive game since mid-December at Kentucky and freshman forward Timmy Allen posted 17 points and a season-high 12 rebounds for Utah (11-8, 5-2 Pac-12). The Utes especially thrived when center Jayce Johnson and guard Parker Van Dyke were on the court, as they subdued a Cal team that remains winless in conference play. Utah exploited Cal’s defense, ranked No. 339 in the kenpom.com analytics, by going 11 of 21 from 3-point range in the first half — when the Utes attempted only 10 shots from inside the line. Having practiced Friday evening in the Golden State Warriors’ facility, the Utes came out shooting like Steph Curry and Klay Thompson. The problem was that Cal’s Justice Sueing, Matt Bradley and Darius McNeill rediscovered their own strokes, going 7 of 15 in the first half as the Bears cut Utah’s 14-point lead to 46-42 at the break. “You get fooled,” Krystkowiak acknowledged, with the scouting report having said those guys were struggling lately. Convinced of Cal’s capability, the Utes adjusted. Utah was “far more active, getting a hand in their face in the second half, so they didn’t have those looks,” Krystkowiak said. And the defense suddenly looked a lot better, from his vantage point at the other end. Cal went 2 of 8 from 3-point range in the second half. The Utes themselves were only 2 of 10, yet extended their lead because of Allen’s inside work and Barefield’s driving. Sueing, once a prime recruiting target of Utah’s, led Cal with 20 points. 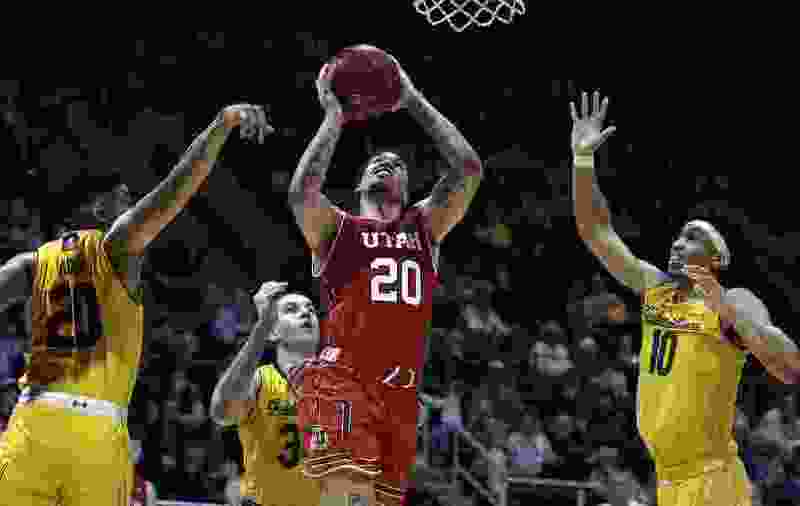 He helped the Bears get within eight points with seven minutes to play, but Allen then scored inside and Barefield hit a jump shot as the Utes kept executing well and scoring late in the shot clock. That’s a perfect, lead-protecting recipe. Utah’s defense took care of the rest, and how often has anyone said that this season? The downside is they’re done with Stanford and Cal this season, in a Pac-12 scheduling rotation that may cost Utah two home victories. The good news is the Utes delivered two road wins, with nothing guaranteed – disregarding Cal’s record. The approach worked. The Utes won a fourth straight game in the Pac-12. That’s meaningful, no matter where it happened.